This collection of essays explores the key issue of the nature of the boundary between fact and fiction, an issue which has become prominent especially through the upsurge of interest in the ancient novel and recent work on the rhetorical character of ancient historiography. The collection covers early Greek poetry (E.L. Bowie), Greek and Roman historiography (John Moles and T.P. Wiseman), Plato (Christopher Gill) and the Greek and Roman novel (John Morgan and Andrew Laird), and especially considers how far 'lying' was distinguished from 'fiction' at different periods and in different genres. Christopher Gill is Professor of Ancient Thought, University of Exeter. His books include Form and Argument in Late Plato (OUP, 1996) and a translation of Plato, Symposium (Penguin, 1999). Peter Wiseman is Emeritus Professor of Roman History at Exeter University and a Fellow of the British Academy. He came to Exeter in 1977, and was Head of Department from 1977 to 1990. Although he retired in 2001, he is still involved in graduate teaching at both MA and PhD levels. ‘I've been obsessed with the history and literature of Rome for nearly half a century’, he says. 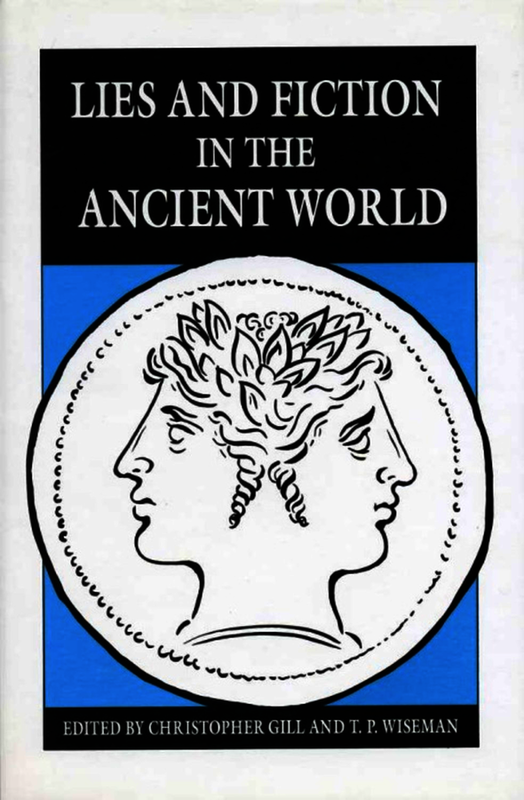 Among the results of that obsession have been books on Catullus (Catullan Questions 1969, Catullus and his World 1985), on Roman political history (New Men in the Roman Senate 1971, Flavius Josephus: Death of an Emperor 1991), on Roman historiography (Clio's Cosmetics: Three Studies in Greco-Roman Literature 1979, Historiography and Imagination: Eight Essays on Roman Culture 1994), and on Roman myth and legend (Remus: a Roman Myth 1995, Roman Drama and Roman History 1998). Reviews of T.P. Wiseman books include the following comments: 'quite simply brilliant' (Times Literary Supplement), 'enthralling' (London Review of Books), 'stylistic elegance and wit, dazzling erudition and imaginative flair' (Classical Review), 'exceptional analytical skill and creative imagination' (Bryn Mawr Classical Review). Despite its selective focus, this superb collection of articles on the problem of fiction in antiquity is a valuable acquisition for any general library, the scope of the book and the range of the individual contributions extensive enough to ensure that the evidence for this protean literary category is given generous coverage. It has long been recognized that the imagination of the novelist, the poet, and the historian must be related in important, intimate ways. This collection advances our understanding of those related imaginations. If the range of ideas developed by ancient writers does not precisely correspond to modern categories, that is hardly surprising: as Michael Wood and D.C. Feeney argue, the boundaries between fact, fiction and falsehood are culturally determined and change over time. This book explores the varying ways in which these categories were constructed in the ancient world, and in the process raises important questions about the definition of fiction in contemporary culture.